This holiday season is proving particularly difficult for me ... I'm feeling very sad, lonely and dejected. One memory that keeps running through my mind is the one where my mom and sister were in the kitchen making cookies and I wanted to help ... To just frickin' belong for once g*dd*mmit! "You want something to do? ", the female parental angrily spat at me ... "Come with me, I'll give you something to do!". She drug me out into the backyard and gave me a set of post hole diggers ... "Start digging, and don't stop until I come back out and tell you too!" I dug the biggest, damndest, deepest hole I could while looking into the kitchen window at them working happily together in the kitchen wondering what the hell was so effing defective about me that I couldn't be a part of (or to simply feel I belonged in) that g*dd*mn effing group known as my "family". She finally came out about a half hour later, angrily yanked the post hole diggers away from me, and handed me a fricking teaspoon ... One of those actual ones used to measure while cooking ... "Here! ", she spat at me! ... "Now I want you to fill that hole back up, one teaspoonful at the time, and if I catch you cheating, I will beat the ever living hell out of you!" ... "Shut Up!, crying won't do you a damn bit of good - Now, get busy!". I, now angry too, got down on my hands and knees by that big old pile of dirt and started spooning the @#$%! back in one teaspoonful at a time as ordered ... The last thing I needed was another beating, and she sure as hell would do it too - with that damn big old stick she called her fricking "Moses Rod". I was sobbing incredulously, angrily cussing, wondering exactly what in the hell I had done to any of them in my life for them to treat me with such hatred and abuse as I filled that g*dd*mned hole back up exactly one teaspoonful at the time. I still feel to this day as if I am a human being of little value and worth. Always trying too damn hard to fit in and belong. The fricking hole (cavern) that these repeated rejections and abuses by family of origin left in the heart and soul of me won't ever be able to be filled up, healed or repaired. I'm too the point now that I don't want to even try to connect with people anymore because I'm either too much or not enough, and find myself too deeply wounded all over again when I am unable to make a healthy connection because of all the impossible obstacles I must overcome in order to do so. 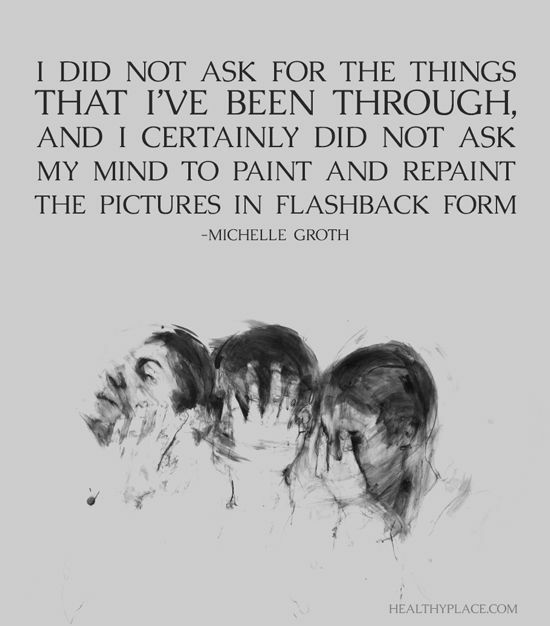 This is what's so nefarious about C-PTSD and its intrusive memories and flashbacks. I do not like having them, but they are there nonetheless. I'm trying to be present in the here and now, but they keep stealing that away from me too. I've all but given up on any future that I should've been supposed to have. I have it too. Xmas is the worst time of the year for me. I don't even remember yesterday. Today I've meditated almost 4 hours and walked 5 miles, and I'm in a condition where I can at least verbalize how I'm feeling and have been feeling...not feeling good, but I can describe it, and there's nothing I've ever been able to do about it except wait for it to go away until next time xmas rolls around. The way I feel I liken to the violence of a roll-over car accident. Every Xmas I have to get back in that car and go for that damn ride and wait for the roll-over. I'm not driving sometimes, but sometimes it might even be me who is doing the driving. No idea where the car is going, I just have to be in it and the roll-over happens no matter how much I wish the car could stay on the road. And I didn't see my family and never do on xmas any more, but I still have to get in that imaginary car. Oh and if I had been in a wreck, I could bring people to the junk yard and show them the wreck I survived...but with a family, there's no concrete evidence like this. More than likely you try to get help and the family member will say, "I know your mother, and she wouldn't do that!"